A web portal is a website that offers the user, in an easy and integrated way, access to a series of resources and services related to the same topic. Includes: links, search engines, forums, documents, applications, electronic purchase, etc. 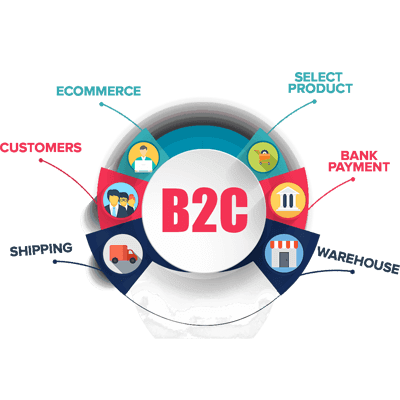 Mainly our B2C portal development company in India is aimed at solving information needs specific to a particular topic. Usually, there are thousands of projects that appear on the internet but many of them fail due to improvisation and little planning. At Mega Web Design, we offer you a comprehensive solution to launch a successful portal. The definition is very general, but it clarifies why the creation of a web portal is a service that can be declined in many ways and for many commercial sectors. Do you have a precise project in mind and create a professional web portal with all the features to simplify the search for online resources and the positioning on search engines? At Mega Web Design, we can offer you solutions that are beautiful to look at, comfortable to update and structured to best meet the needs of users who surf from a computer or via mobile devices. We can create tourist web portals, e-commerce portals and B2C web development services, such as an information portal. Horizontal portals, also called mass portals or general purpose portals, are aimed at a wide audience, trying to reach all people with a diverse offer. Vertical portals, are aimed at users to offer content within a specific topic such as a music portal, employment, real estate, and a portal of personal finance, art, education or sports. Diagonal portals: it is a mixture between the horizontal and vertical portal. It would be portals that use social networks or generalist applications such as Facebook, Twitter, LinkedIn, Flickr or YouTube supplemented with content and utilities aimed at a very specific audience. Portals usually have programming that requires a lot of computational resources and because of their high traffic they are usually hosted on dedicated Internet servers. Why Choose Us for B2C Web Development? The portals have a history of a few decades, but online information is constantly increasing and finding a way to untangle it is a need that is not falling. In fact, users are always more familiar with the Internet and therefore before deciding to rely on one portal rather than another, they evaluate it. That’s why appearing professional both from a graphic point of view and navigation becomes fundamental.